The eagerly anticipated opening week of the Bassetlaw & District season was eventful but rain-affected. A fantastic start for Mansfield Hosiery Mills reflected their recent Premier League experience. They defeated Notts and Arnold Amateur by 188 runs, scoring 263-5 with a fine knock of 91 from Tom New. This was supported by mature innings from Matt New with 31 and 58 from Mark Smallwood. 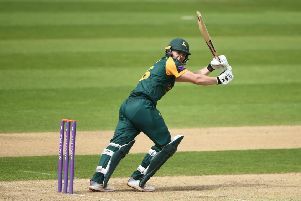 In response, Notts and Arnold Amateur were bowled out for only 75 due to the devastating bowling of Matt Wright, who took eight wickets for only eight runs. The matches at Thoresby, Edwinstowe, and Retford all ended in rain-affected draws. Thoresby bowled well on a changeable day weather-wise, as Glapwell were restricted to just 158. Mohammad Yasar and Nayeem Ahmed both took four wickets before limiting Glapwell to 83-7, with Matt Page taking four wickets. The game between Retford and Worksop fell foul of the weather, despite Retford making an impressive 207-4. Worksop replied with 37-1 before rain stopped play and the match was abandoned. Retford gained 10 points and Worksop seven points as the match was declared a draw. Clipstone took the full 20 points available as they defeated North Wheatley with Leverton by six wickets. Louis Sprigg and Ian Woodall both took three wickets and restricted Wheatley to 110. The only other game in the Championship saw Papplewick and Linby play Kiveton. The match ended in a draw, depite Papplewick scoring a substantial 371-4 with Alex Lloyd hitting 137 and Shahrayar Aslam 163. In response Kiveton made a dogged 230-8 with a knock of 77 not out from Richard Grainger. Anston versus Edwinstowe was dominated by Anston, who made 277 all out. Chris Pickering made 70 and Chris Dobson took four wickets and Tom Ward a further three wickets. In response Edwinstowe made 70-4. This resulted in Anston taking 11 points and Edwinstowe 10 points. This was an encouraging start to Edwinstowe’s campaign as this was their first game in the Championship following last year’s promotion.